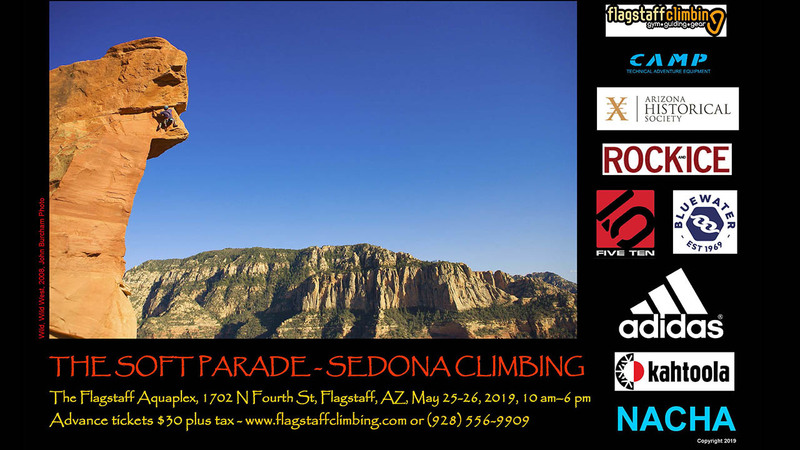 Granitica Festival 2019 The Soft Parade- Sedona Climbing Program The North American Climbing History Archives (NACHA) and I are pleased to announce that the fifth Granitica Festival will be held over Memorial Day weekend May 25-26, 2019 at the Flagstaff Aquaplex. In addition we have a long overdue Sindicato Granitica Banquet happening on Memorial Day. For the fifth Granitica Festival we will be examining the history of climbing in the Sedona area starting in the 1950s to the present day. The two full day program will feature speakers discussing their climbs of record and other experiences with image support as possible. The tentative speakers list as of 3/26/2019 is; Karl Karlstrom, Mark Axen, Scott Sellers, Bill Hiscox, Lee Dexter, David Lovejoy, Tim and Larry Coats, Paul Davidson, Jim Haisley, Steve Grossman, Tim Dolan, John Mattson, Erik Wolfe, David Bloom, John Burcham, Chris Tatum, Glenn Rink, Jeff Snyder, Jake Dayley, Blake McCord, Zach Harrison, Laura Sabourin, Jake Tipton and Eva Christ with several more yet to confirm. Those in attendance have the opportunity to hear about establishing the many great routes that this area has to offer and then meet those involved to learn even more. This will be a unique gathering of climbers which will be recorded by Steve Grossman as part of his work as executive director of the North American Climbing History Archives (NACHA). The NACHA mission is: To gather, document and celebrate climbing history in image, word and artifact with special emphasis on personalities and events in North America and fostering climbing culture. Tickets are $30 plus tax in advance and $35 day of show and are available from the Flagstaff Climbing Center at (928) 556-9909 or online at www.flagstaffclimbing.com (https://bit.ly/2OvPfV7).